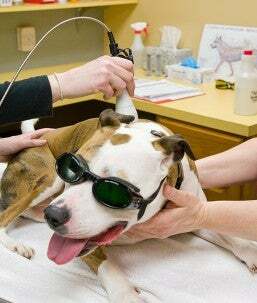 Cold laser therapy is a noninvasive, stress-free and drug-free method used to treat post-surgical pain as well as many acute and chronic conditions including arthritis, joint or muscular pain, wounds, post-operative incision healing, reduction of swelling or edema, allergic dermatitis, lick granulomas, ear infections, and urinary tract disease. The cold laser treats these conditions by improving blood flow to the area, blocking nerve pain fibers, stimulating nerve regeneration, hastening wound healing and reducing bacterial growth. All cold laser therapy treatments are performed by our kind, caring, experienced staff who will give your pets the quality care they deserve while keeping you informed every step of the way. At Rincon Vista Veterinary Center we put our experience and expertise to work for you, keeping your pets happy and healthy for as long as possible. 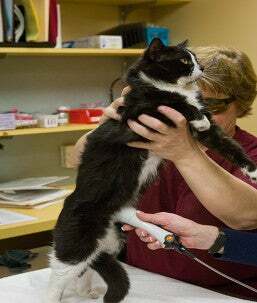 With a modern, up-to-date facility, we offer cold laser therapy treatments in a safe and comfortable environment where your pet will feel at ease.